Home > Solar Installation > Solar Panel Maintenance: How often should they be inspected? Solar Panel Maintenance: How often should they be inspected? Some defects found when inspecting badly installed solar. If you suspect your system was shoddily installed, you should book an inspection ASAP. But how often should your system be maintained/inspected if you used a reputable installer? Is getting your panels inspected worth the expense? In the end, it comes down to how safe you really consider your rooftop solar to be. How Safe is Rooftop Solar? If you ever drive or ride in a car of your own free will, then it probably makes sense for you to consider rooftop solar safe. Each year, the average Australian has about a 1 in 20,000 chance of dying in a car accident. But as far as I am aware, no one in Australia has ever died from a faulty solar system. Oh, sure, some installers may have fallen off roofs and some do-it-yourselfers may have managed to electrofry themselves, but I don’t believe anyone has ever died as the result of a fault in an installed system. This is a pretty impressive result given the number of shonky installers Australia used to have (and, unfortunately, in some areas, still has). At the start of this year around 17.2% of Australian households had rooftop solar1. This made for a grand total of over 1.6 million systems. On average, each home has had solar for 4.8 years, which comes to a total of over 7.7 million years without a fatality and that’s not bad. Unfortunately, rooftop solar is not perfectly safe. Anything with live current running through it can be dangerous if damaged or defective and solar systems are no exception. Fires have resulted from faults and, while most have been small, some have resulted in whole buildings being burned to bits. Deterioration of cable insulation over time. Damage from natural disasters such as earthquakes, bush fires, and storms. Having a professional inspect a system can result in problems being identified and rectified before they become a danger. Most rooftop solar systems have a string inverter. This is basically a box that hangs on a wall and is connected to rooftop solar panels by one or more cables called strings. These cables send DC power from the panels to the inverter which changes it into the AC power homes use. The drawback of string inverters is DC power isn’t as safe as AC power. The danger of a DC arc occurring in a system that has a string inverter is the main safety reason why I would recommend ever having an inspection. Rooftop DC isolators are switches Australian Standards require to aid our brave fire fighters in their struggle against fire. Unfortunately, these fire-fighting devices have the rather horrible habit of starting fires themselves. Roofs are pretty harsh environments and if isolator switches aren’t built tough enough, they start to deteriorate from exposure to the elements until they become flaming dangerous. Rooftop isolators are often the weakest link in the entire solar system. While many of these fires have been confined to just the isolator or the area immediately around it, there have been some that have branched out to burn down entire houses. Isolator fires are particularly dangerous if the wind blows leaves and twigs from nearby trees onto the roof and they collect under the solar system and provide some convenient tinder to set the roof ablaze. This is what happens when an isolator catches fire. This one was obviously not on the roof. There have been both mandatory and voluntary recalls of DC isolators. Most were recalled before 2015, so if your system is reasonably new, the isolators are likely to be reliable, although it’s probably still not a good idea to trust them. Not all of the ones that are known to have problems have been replaced and this is something an installer can check when they inspect your system. Microinverters are little inverters that are either built into solar panels or installed underneath them. Because they directly change the DC power produced by panels into the AC power homes use, there are no cables carrying DC power about the place and so far less a chance of the arc-angel of death popping round for a visit. 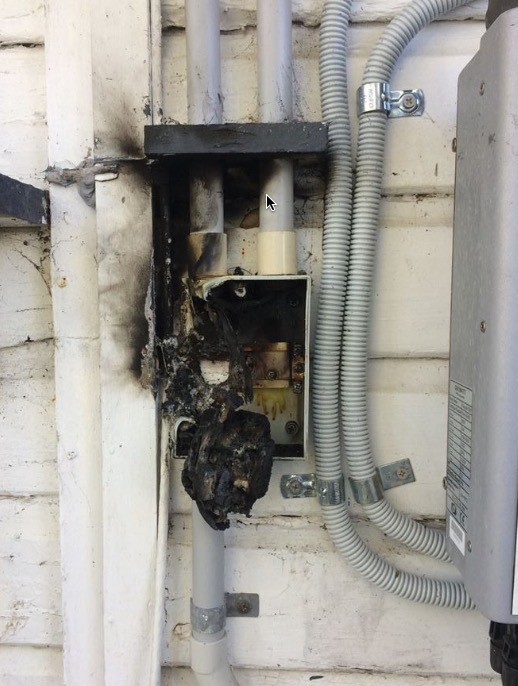 There is also no need for rooftop DC isolator switches, with their nasty habit of immolating themselves. While damaged AC cables are definitely still dangerous, they are much less dangerous than damaged DC cables. A solar system that uses microinverters is really no more deadly than any other electrical item in your home. And possibly less so, because there are no moving parts. They also have the advantage that they can usually be easily monitored online and if they fail, normally only the output of one panel will be lost. Inspections: How Much And How Often? The going rate for an inspection by an accredited solar installer is typically $200 to $300. For that money, they will check the connections, cables, panels, rooftop mounting, DC isolator switches, and inverter. Some offer to do extra tests for extra money as part of a premium service, but as far as safety is concerned, I don’t think the extra expense is worth the benefit. I have been told by an installer the Clean Energy Council recommends an inspection every five years. However, an advertisement for rooftop solar inspections told me the Clean Energy Council recommends annual inspections. What the Clean Energy Council actually thinks, I don’t know. If they had a strong opinion, you would think they would have put it on their site somewhere, but I can’t see it. What do I think? Well, if you’re going to get it done, I would suggest getting an inspection every five years. So Do You Gamble And Forgo An Inspection Or Not? When you’re moving into a new home that has a “mysterious” solar system. When you suspect your system was installed by shonks. When you live in an area where you’re required to have an anti-islanding test. New Home Has Solar? Consider An Inspection. When you move into a new home that has a solar system installed, the former owners might leave you a wealth of information about it or they may be able to tell you nothing. Some people don’t even know they have solar. If you end up the owner of a string inverter system that is full of mystery and potentially full of faults, then it could be a good idea to have it inspected because you can’t be certain what condition it is in or whether or not it was installed by shonks. Think Your Installion Was Shonky? Consider An Inspection. The best way to ensure your installers aren’t shonky is to use reliable installers in the first place. But mistakes are made, snaky salespeople can be persuasive, and people fall for deals that seem too good to be true and which turn out to be exactly that. If you suspect shonks have done a shoddy job of installing your system, it may pay to have it inspected. In Canberra and Victoria, solar households can be required by their network operator to have an anti-islanding test done every five years. This is designed to keep the grid and anyone who might be working on it during a blackout safe. But since you will have to pay for an accredited installer to come out anyway, you may as well see if you can have your solar system inspected at the same time. If you are so inclined, and you have two or three hundred dollars to spare, you can afford to have your rooftop solar system serviced. When I say serviced, I’m not talking about a cursory check by someone so unskilled they’re unaware installing solar panels upside down is a bad idea. I am talking about a good service performed by a professional who will check out your system in detail to make sure everything is working properly, and above all, safely. If, on the other hand, you don’t have the dollars to spare, take the main safety factor into account – inverters. Microinverters have a safety advantage over string inverters. If you have a solar system that uses microinverters, doing without rooftop solar inspections is really no more dangerous than doing without inspections for other electrical devices in your home. 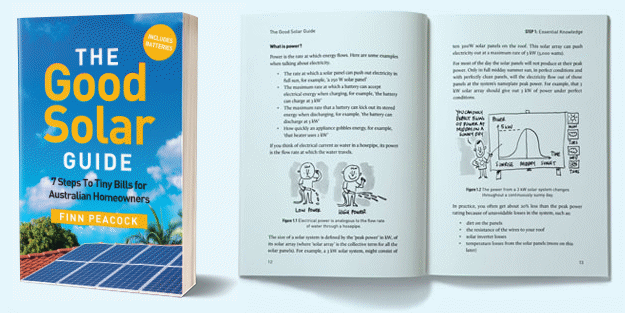 If, however, like the majority of solar households, you have a string inverter, then, regardless of how tightfisted you are, it is probably a good idea to have your system inspected about every five years. Also, I would ask, “Are we related?” because you’re thinking like me and that’s always disturbing. The fact is, when I came up with my recommendation to have solar systems inspected every five years, I was trying to think like a normal person. It wasn’t easy, but I persevered. Normal people seem to enjoy doing things that keep their families safe even when the cost/benefit ratio is ridiculously poor. They get a sense of satisfaction from it. In truth, I don’t get that sense of satisfaction. And I’d say that’s probably the number one reason why I keep getting divorced. I’m fairly sure it’s not my smell. Paying for rooftop solar inspections will help protect your property against fire, so it does have other advantages, but it’s not very cost effective and, unless you have a reason to suspect your solar system has a problem, you are not putting your family at any significant risk if you don’t have them done. When it comes to saving human lives, you are probably better off paying to distribute mosquito nets, trading in your car for one with a higher safety rating, joining a gym, or paying someone to remove the crocodile from your living room. But the final choice is down to you. If you want the sense of satisfaction that comes from knowing you’ve done something to keep your family safe, even if it is only a very small thing, then ensure your solar system is in good working order – have your system inspected. Modern Solar needs to take its place at the list of shonky installers. If you send me your email address I’ll email you the photos of what they did at my place. Hi Ronald, the photo of the panels on the tiled roof happen to be mine. Was installed 2010 & still working well, has never been inspected in all that time. Did I send my drone over your house? Drone, trained fruit bat, same thing really. But I am glad to hear you haven’t had any problems with your system. I think you may have missed an important one… In the SAPN distribution network, this is the LAW…. does it part of post sales procedure for inspection and maintenance of solar panel? I have found the relevant documentation, SAPN’s Small Embedded Generation Technical Guidelines, and updated the article. It will be interesting to see if SA Power Networks do start going around and checking to see if households have had their rooftop solar systems inspected within the last 5 years and disconnecting them from the grid if they haven’t. It might increase the sales of battery storage. You mentioned in your article about panels being installed upside down. I expect your comment was tonge-n-cheek that the panel are facing the roof. My question is, my panels have the serial number listed on the high side of the panel, are these panels upside down? Should the serial number be at the bottom of the slope? Asking because my Trina panels are getting a lot of water stains inside and some areas look like the wires inside are cut through or shorted (not burnt). Are solar panels sealed all around, so it doesn’t matter which way they are installed. Is this a true statement and should I be concerned? Skipper, there should be no problem mounting modern panels upside down, that is, with the junction box at the bottom of the slope. The panel and its junction box are supposed to be extremely water resistant and so it shouldn’t matter which way around it goes. However, just to be on the safe side, it is probably a good idea to put the junction box at the top of the slope as this will stop water collecting where the cables come out of the junction box. This extra precaution shouldn’t be necessary and I don’t think you have much to worry about, but I would say it is still a good idea, just in case. But it is not water that has caused those marks on your solar panels. 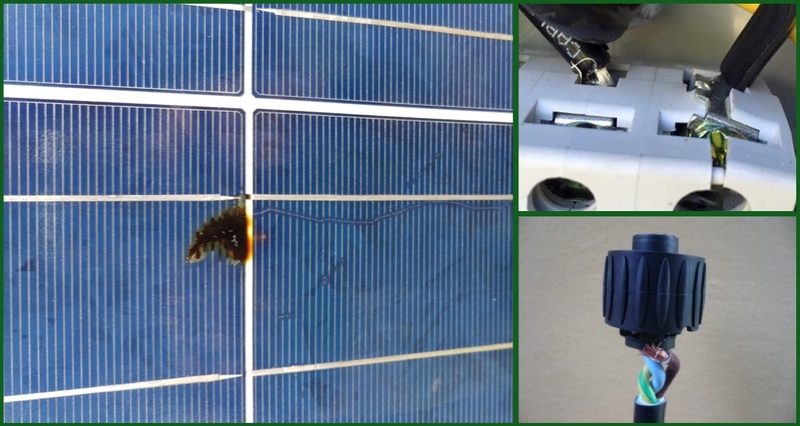 Snail trails on solar panels are caused by Potential Induced Degradation or PID, which is basically damaged caused to the solar panels by electricity not going where it is supposed to go. It does not happen in well designed panels. The snail trails will degrade performance and the damage can start off slowly and then accelerate. If it is bad enough to break the wires (busbars) that cross the solar cells then it seems particularly advanced. If wires are broken, it’s not just aesthetic. Unfortunately, it is very common for solar panel companies to refuse to replace panels that suffer from snail trails unless they have deteriorated enough for their performance warranty to cover it. One thing you can do is keep track of your system’s performance and if it drops low enough then your written warranty will apply. Of course, they may then only replace the worst panel and leave the others there. FAULTY PANELS… you really need to read the fine print when it comes to panel warranty. JA Solar has a major problem with snail trails marks under the surface glass and on top of the cells of their panels. JA Solar say it doesn’t affect the output of the system which i do not believe, only after 3 years so you can imagine what they will look like after 10 or 20 years let alone their performance. The individual tests from each panel from over a long period they want from your installer to accompany the claim will cost you more than the original cost of the system. JA Solar Aus virtually didn’t want to know about it and were no help at all. The defective panels have to be sent back to the manufacturer CHINA… guess who pays for shipping. IF found they are faulty and the replacement panels shipped to Aus… guess who pays the shipping. DISGUSTING. ps….. I inspect my solar panels every time I come through the front gate. when I had my install ETSA “Small Energy Generator Terms” page 3, item 7 clearly establishes a legal obligation to have inspected no more than every 5 years. So if your are on the old 44cent scheme you may want to continue the inspections. so this may provide SA POWER with an out for Breach of contract. Can you recommend some reputable brands of DC isolators? My potential installer uses ZJ Beny DC isolators. I’ve never heard of these and don’t know if they are good. I worry due to the recent stories about fires caused by DC isolators and the recalls. Unfortunately with DC isolators it is more a case of finding out which are the bad ones after the fact than knowing ahead of time which are good. Even if they pass testing with flying colours it impossible to be 100% certain how they’ll handle years of exposure to the elements on a roof. I can tell you ZJ Beny DC isolators are not one of the prohibited ones and many installers use them. They appear to have a good reputation. Since they are widely used, if they had a problem, hopefully that would have come to light by now. Hi, I still can’t believe that the so called experts from both the electrical and solar industry insist in their standards that we put a DC Isolator on our rooftops. The DC Isolator is the least reliable part of the solar system and we put them in the most hostile environment in this this sunny country of ours. While most manufacturers state that the enclosure that they supply is UV resistant I have never seen one that is UV Proof. Usually after 4-5 years of direct exposure to sunlight they are so brittle that one small tap and they fall apart and generally they are full of water due to cracking. I have experienced this. Putting a cover over them does not stop the effect of UV light, it lessens the effect and increases the time for the same result. If the powers that be claim it is for safety then the don’t know much about Photovoltaics. 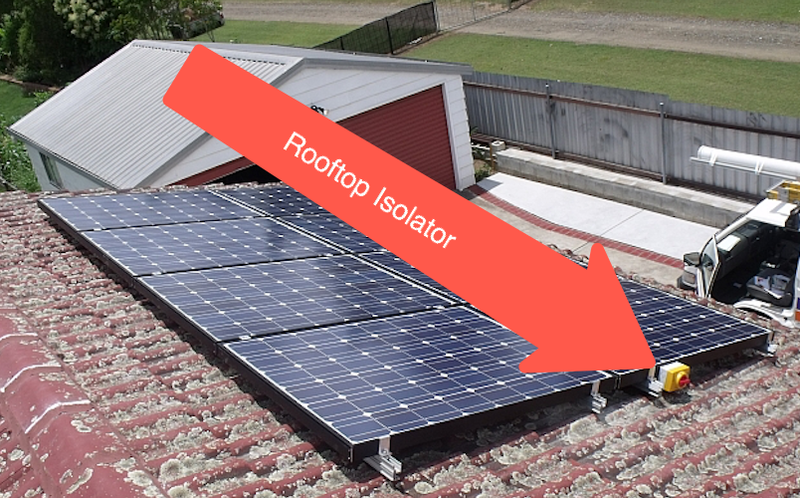 The rooftop Isolator when turned to the off position disconnects the power going to the isolator at the Inverter and the Inverter shuts down, it does not deactivate the generating capacity of the panels. While there is light falling on the panels they provide a potential and this can be up to 600 volts on a domestic system and up to 1000 volts on a commercial system. That potential is there all of the time whether the Isolator is off or on and it will bight you all of the time. The only way to stop this potential is to cover the panels completely. After the roof insulation debacle we as Electricians have been constantly reminded to turn the power off when entering a roof space and we have been given stickers to place on manhole covers to remind all and sundry to turn off the power before entering the roof space.. Turn the system off before climbing on the roof. In an emergency you don’t need to be running up to 20 metres to turn off the roof Isolator only to find that it doesn’t kill the power and the Isolator falls apart in your hand and gives you a boot as well. DC is a powerful source of energy it will kill you and burn you. Off all the signage that we put on a Solar System we don’t have to erect one that says to turn the system off before going on to the roof. We should have the clause or clauses that say we should be installing Isolators on rooftops totally removed and a requirement for altered signage for the systems. Hello everyone, I have a question? It is compulsory for a Solar system to be inspected and maintained every 2 years by an accredited solar electrician? The reason I ask is it’s stated in the T’s & C’s of a Company who is quoting me on a 5KW solar system where I’m required to pay $200 every 2 years for an inspection as part of the warranty. You can be required to have your system inspected every 5 years by your DNSP (Distributed Network Service Provider) but, as far as I am aware, not every two years. Whenever you purchase something in Australia for under $40,000 you are protected by Australian consumer guarantees that apply no matter what written or verbal warranties you were give and they will still apply if you do not have the system serviced every two years. Thank you for the info, I did believe it was compulsory to pay someone $200 every 2 years for the next 25 years. This is what is written on their T’s & C’s. You agree $200+ GST will be charged to You every 2 years for service on parts and warranty. This is known as a ‘back to base’ warranty. It is compulsory for a Solar system to be inspected and maintained every 2 years by an accredited solar electrician. Seems like a bit of lie to get a little extra cash. Let me know your Distributed Network Service Provider (it should be on your electricity bill) and I will look up their requirements. Is there a preferred way to clean roof top solar panels? Ours Have been up for a couple of years now and have a covering of dust on them.